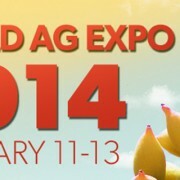 TULARE – The 47th annual World Ag Expo will be held Feb. 11-13, 2014 in Tulare, Calif. The largest annual agricultural exposition of its kind, World Ag Expo touts 1,500 exhibitors who display cutting-edge agricultural technology and equipment on 2.6 million square feet of show grounds. An estimated average of 100,000 individuals from 70 countries attend the Expo each year to learn about the latest advances in agriculture. General admission at the gate is $15. Purchase tickets in advance at www.WorldAgExpo.org and use coupon code “WAE2014″ to save $5 on each ticket. New for 2014 is the World Ag Expo Arena in the southwest area of the show grounds. The Arena will be home to daily Exhibitor Showcases, facilitated by Ritchie Bros. Auctioneers. Attendees will enjoy watching the show from the comfort of their seats as exhibitors drive their equipment past the bleachers. World Ag Expo attendees can get the latest news, information and updates about the show by downloading the new for 2014 mobile app. The free app provides mobile access to the schedule of events, an exhibitor directory, map of the show grounds and other visitor resources. The app is available for download by visiting the iTunes store or Android Marketplace, search for “World Ag Expo 2014″. For a full schedule of events and more information about the show visit www.WorldAgExpo.org.